In order to increase exoelectrogenesis (rate of electron export), we planned to introduce two parts into Synechocystis - oprF and RibH. Unfortunately we encountered some problems when working with the parts (mainly, we couldn't locate a suitable RBS to combine with them in order for them to be expressed in our chassis), so it wasn’t possible to test these in Synechocystis PCC6803. However, we did manage to create a biological photovoltaic cell with Synechocystis PCC6803 and to test if overexertion of the cmpA gene would have an effect on the potential measured, just as it has an effect on the rate of growth. 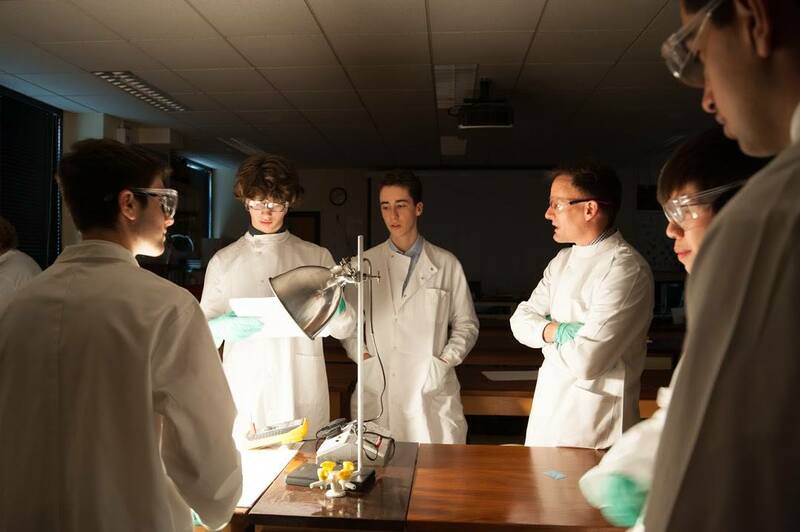 In this experiment we investigated the effect of differing amounts of time exposed to light in solar cell conversion of light into electricity. We measured the voltage across 4 different solar cells. Two were kept in light overnight and the other two were kept in darkness. After being kept in their relevant conditions throughout the night, the solar cells were then kept in the dark for 10 minutes before we put them into fuel cells. Then, the two solar cells that had been exposed to light (Light 1 & 2) and one of the solar cells that was kept in darkness (Dark 1) were exposed to light (lamps set up either side of the cells) whilst the voltage (mV at Lux: 790) was being recorded. This was done using a voltmeter with connecting wires on the electrodes of the fuel cells. We recorded the voltage at 10-second intervals for just over ten minutes (620 seconds). Therefore, we were able to measure the potential difference against the amount of time following the solar cells’ exposure to light.. The solar cell we used as a control showed a change in voltage over the 620 seconds starting at 80mV and finishing at 68mV. Light 1 (starting at 266 mV) showed a very slight initial change in voltage before changing by a small amount to 253mV. Light 2 only increased in voltage from 224 mV to 250 mV. 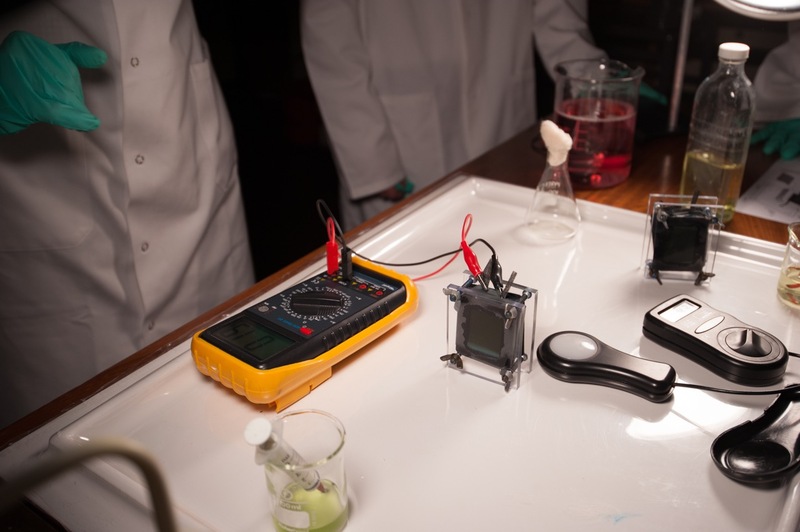 Dark 1 showed the biggest increase in voltage (146mV to 258mV) and we decided to focus on this experiment in our future measurements as this replicates the natural conditions that a fuel cells would have been exposed to the most. Figure 2. 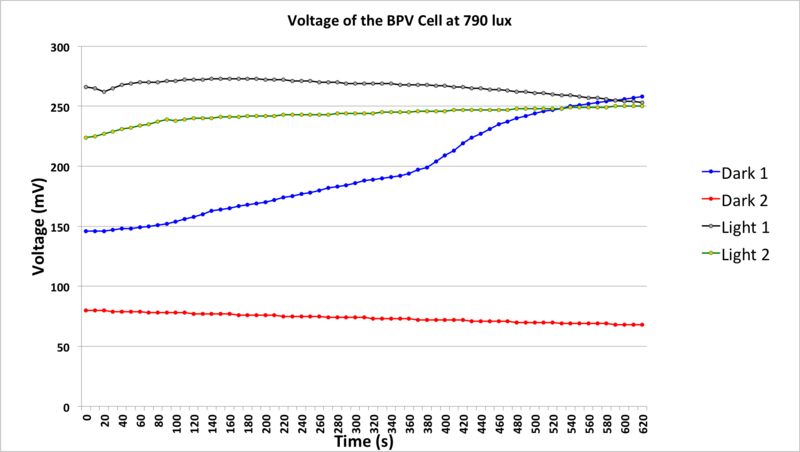 Initial measurements of voltage using the model BPV cell with untransformed Synechocystis PCC6803. On the basis of these measurements and given the night-day cycles that the Dark 1 cell replicates, we decided to repeat this experiment in the future. Unfortunately, whilst our measurements show that this type of organism could be used in BPV cells, it also shows that increased growth does not necessarily go hand in hand with increased voltage generated. This is why further work on increasing exoelectrogenesis is important. Figure 3. Comparison between the initial measurements and measurements of voltage with transformed Synechocystis PCC6803.